4 am. My internal alarm had struck again, waking me entirely too early as it had done every morning of that long, sleepless month. I rolled out of bed, tied the bathrobe around my waste, and shuffled down the stairs to my dimly lit kitchen. Fingers fumbling, I flipped on the lights and punched the coffee button to brew. The pot percolated, singing it’s usual serenade as I stared longingly out the window to my dimly lit backyard. Empty cup in hand, I waited patiently as I pondered my prayer from the night before. Casey and I had been grappling with a monumental decision to enter into ministry. God was telling us to go but I still had an unsettled feeling and was struggling to figure out why. My mind was exhausted, my emotions were taxed, and a decision needed to be made. So, I had prayed before bed that I would wake up with answers. How soundly I had slept that night, resting on the promise that God would be faithful and guide me. Now early morning had come again, and there was no new revelation. Disappointed, I sighed heavily and poured out the cry of my heart as I flooded my mug with warm brew. Where are you God? Why won’t you speak to me? I reached for my laptop and logged on to my morning devotional, feeling unmotivated to read the current series about people in the Bible who had encountered Jesus. "Must be nice," I grumbled greedily as I waited for the page to load. It started like most other stories, a man who had come to Jesus asking questions and seeking answers. He was The Rich Young Ruler. You can read more about him in Matthew 19:16-26, but the gist of the story is this -- He considered himself to be religious and full of righteousness, but he loved his possessions and reputation more than he loved God and others. We know this because when Jesus asked him to surrender his status and follow Him, The Rich Young Ruler couldn’t do it. And the Bible said that he walked away and was grieved. I was The Rich Young Ruler. And I couldn’t surrender my kingdom. I could see him there, head down as he wandered away from the presence of Jesus. Perhaps he returned home to all that he had and realized it wasn’t enough. I’m guessing he knew all along. For he was The Rich Young Ruler. And most days, so am I. I want what Jesus has to offer, but I don’t want to give up what I have in order to receive it. The Bible calls that an idol- a trap that keeps us living in tiny man made kingdoms. It doesn't mean possessions are bad, it just means they shouldn't be worshiped. At the end of the day, this new opportunity for my family was nothing short of a question that Jesus was asking me…. Are you willing to give up your reign and really be my disciple? God, in his mercy was reminding me of what I had forgotten all along; I don't need to build a kingdom with my hands when He's placed His in my heart. It's a kingdom that tells me who I am and where I belong and beckons me to come home. Joy filled my heart as I closed the lid to my laptop. God hadn't forgotten me. He had heard my prayer and answered it in His time and in a way that only I so perfectly needed to hear. I didn't have to walk away in grief. It was time to surrender the kingdom. I sit at kitchen window, as they fall without a sound. These pointed shapes with stems that always land on solid ground. Months before they hung on high, green leaves lived out their calling. No scampering squirrels or summer storms could force them into falling. Today the fall winds blow, the humble tree, he senses this. Unclenching fists of foliage, golds and reds no longer his. It's now time to surrender what was once so tightly held. He cannot hold what is not his, though he might feel compelled. The petals find new purposes from all the letting go. From canopy to compost they surrender to fall low. I see those leaves, their arms stretched wide, soon kissing city streets. My heart beats fast to think of faith and death defying feats. Unlike my florid friends outside that drift, and float, I cling. When new winds blow, I struggle to be carried without wing. Instead I try to staple to my branch that now needs mended. I long to stay high on my limb, so tidy and so tended. The broken bark and winter wood, it begs me to let go. It's time now for new seasons, seeking wonders I don’t know. I fight to tear at limbs that once had held me so secure. I’m frightened by the thought of knowing not what is for sure. "Be free," I whisper softly, as I feel my fingers slip. I see the open ground below, and tighten up my grip. I’m not made for hard landings, broken pieces, shattered ends. When falling means misfortune, I’d much rather try to bend. And then I think of Jesus, how he let go of on high. Came low to cling to wood and cross, to suffer and to die. His matchless grace that saved me then, lives on to save me still. The suffering he endured I do not know and never will. By his breath he changes seasons and commands the winds to blow. His hand reaches to save me, and to hear me he bends low..
And here I find my falling, not like leaf without a care. My letting go means holding to the one my burden bares. I’m free to find new places and new purposes in life. Abandon can be found without the struggle or the strife. The beauty of surrender, may my heart forever know. I'm held in every season, there's no fear in letting go. Recently, while visiting my grandmother, she asked to sit down with my daughter and me. Picture frame in hand, she explained that she wanted to give a gift to each of her five great granddaughters. My daughter sat puzzled as she examined the contents inside of the frame. I, on the other hand, instantly recognized the shapes beneath the glass. They were quilting patterns that belonged to my great grandmother. My grandmother explained that she found them years ago after her mother had passed away. Unsure of what to do with them at the time, she tucked them away for safe-keeping. 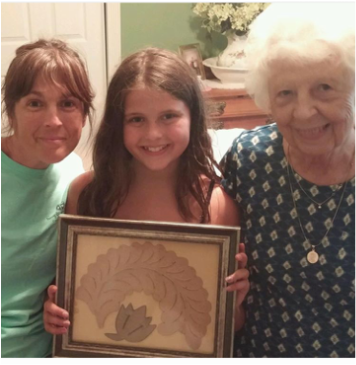 Over two decades and five great granddaughters later, she knew that dividing them up among the girls would be the perfect gift for each of them. A lump formed in my throat as I admired the shapes and remembered my great grandmother and her love of quilting. Fortunate to have several of her quilts, some of them over a hundred years old, I consider them to be one of my greatest treasures. Sewn together by her own two hands, her quilts are more than a work of art to me. Every piece of fabric and stitch points to a simpler way of life that involved time to sit and create. A time when attention to detail was of the utmost importance, and there was no rushing to finish a task. My great grandmother’s quilts remind me that life was meant to be cherished and enjoyed, and that every seam of it is being woven into a tapestry; a work of art in living color that reflects the sum of its parts. While I was so thankful to watch my daughter holding a relic that my great grandmother once used, I was also saddened by the memories of her sitting with fabric stretched wide on a rack. And in that moment, I suddenly felt as though the thread that had hemmed generations of women together had somehow been tethered. Despite the fact that I had come from a long line of quilting women, I had never been one of them. I thought of all of those summers I had spent with my grandmother as a child but never took the time to learn. My grandmother no longer quilts. I had missed my opportunity to learn from her. My daughter would never learn from me what the women before me had learned from their mothers. My heart sank with regret as I realized I had let something so special slip through my fingers. My daughter happily handed the frame to me and thanked my grandmother for the gift. I knew that she was appreciative but could not yet understand at her age what a special keepsake she had been given. As I sat there, holding the weight of five generations of women, I told my grandmother that I was sorry that I never took the time to learn from her what she had learned from her mother. And that’s when she hit me with a life changing truth. “I didn’t learn how to quilt from your great grandmother,” she explained. In fact, when she was a little girl, her mother all but begged her to learn to quilt but my grandmother would have nothing to do with it. I sat there shocked as the image of my grandmother quilting with her mother shattered. In fact, my grandmother didn't begin quilting until she took an adult ed class at a local high school. "We made a pillow top," she told me. "And I thought, if I can make that, I can make a quilt." My grandmother learned to love quilting in her own time and in her own way. She went on to make at least thirty quilts for friends and family members; praying for them while she worked on their quilts and reflecting on how much their lives meant to her. A wave of relief washed over me. The circle had not yet been broken. Not in theory, anyway. While I know that this busy season of working and raising kids will not provide time for quilting, I can look forward to the day that I might have time to learn. And in the meantime, I can still pass on to my children the values that these quilts embody such as the importance of hard work, attention to detail, and the beauty of slow and steady progress in life. The frame of my great grandmother’s quilting patterns now hangs in my living room. One day, it will be passed, along with the quilts, to my daughter and she she will pass them on to her children. And while those descendants will never know the women who stitched them together, they might be inspired to pick up a needle and thread one day and try a few stitches of their own. Either way, my prayer is the same, that they will view the fabric of their lives as an opportunity to create a glorious tapestry. And that they will sew to their hearts content, watching the beauty unfold. I love everything about roller coasters. I love the soaring heights and the plunging depths, the terrifying twists and turns, the shrilling screams of the riders in free fall. My husband and kids love them, too. So much, in fact, that we almost always find ourselves at a theme park or boardwalk at least once every summer. There is, however, one problem…. I don't mesh well with metal contraptions. The coaster camera that snaps the shot. I wasn't on the ride. Obviously, my family knows that my absence from the collection of coaster pics is for good reason. They understand that I've calculated the risks enough times to know that regretful regurgitation outweighs the risk of sky high adventure. But what about the rest of my life? If the moments of life's possibilities were all captured on camera, how many times would I be missing from the frame? What other opportunities and #blessings have I missed out on because I didn't get on the ride? How often have I looked at a situation and thought that the possible regret was easier to live with than the actual risk itself? What if something goes wrong? What if it's just too terrifying? What if it ends in disaster? I'm not talking about reckless living or unwise choices. I'm talking about the things in life that I choose to be absent from because the challenge seems too great, the outcome isn't known, or the cost is too high. I'm referring to the kind of mindset that keeps me from new adventures because I'm too afraid, I don't want to be inconvenienced, or I'm too worried about what others will think if I fail. That kind of thinking makes me want to back away rather than climb on board. It's a false sense of security that keeps me living small, watching and waving as the world flies by. There's no denying the one thing in common among all of our coaster pics; some might love the thrill while others are clearly terrified, but at least they strapped themselves in. I don't want to look back on the snapshots of my life and regret the risks that I didn't take. Hands in the air or white knuckling all the way, I want to be on the ride. I was the prom queen. I was also the pageant queen. I was the homecoming queen as well. It’s starting to get obnoxious, I know. And the worst part is that I don’t even really know how it happened. I had absolutely no poise or grace, and the only two items in my make-up bag were chap stick and eyeliner (not much has changed, by the way). Shouldn’t beauty queens have a little bit more to offer? Recently, while visiting my mom, I stumbled upon a dilapidated cardboard box that she had carefully tucked away for safe-keeping. In it contained all of the relics of royalty from my days of old. I felt frozen in time as my fingers fixed on extracting the mind-boggling memorabilia; newspaper clippings, photographs, leaflets, and cards. Digging deeper, I finally uncovered them; three jeweled crowns nestled among dried flowers and interwoven banners. I was feeling very "Miss Havisham" as I examined the treasures from a lifetime ago. And as I sat there, soaking up the nostalgia, the tiniest creak from the bedroom door stirred me back to my senses. There stood my daughter, surveying the room, and looking very puzzled by the mess. As I motioned her over to sit down and join me, I realized that I had never really shared this part of my life with her. I’m not sure why, really. I guess I just didn’t want her to feel as though this was something that she had to live up to. It’s one thing to pretend to be a princess as a little girl. It is quite another to realize that the glass slipper was your mother’s, and your foot might not be the same size. It sounded like the noble thing to say at the time, but as we sat amongst so many objects that reflected the need to perform, I wondered how true that statement actually was. Perhaps that really was the case in my high school days, but what about now? Why do I often look to others for approval and identity?. Some days, I feel like I'm stuck in prom queen purgatory. I strive for votes. I feel pressured to impress. I want people to be dazzled by me and like what I have to say. I hope they think that I am confident and clever, and that my clothes are cool...What does this shirt really say about me, anyway? And just when I think I am making progress with this pathetic little issue of mine, a sorted voice from the bowels of hell comes creeping into my ears. "You're not enough," it whispers. "You need to be more, do more, accomplish more, and have more in order to be accepted." Sitting on the floor with my daughter that day made me realize that that is a lie that I cannot afford to believe any longer. Not only for myself, but for the daughter that I am trying so desperately to raise in a world full of voices and images that are telling her who she needs to be. God loves us with an everlasting love (Jeremiah 31:3) and to as many as receive Him, He gives the power to be sons and daughters of God (John 1:12). I never did end up bringing that box at my mom's back home with me. I figured I might as well leave all that striving behind. Maybe the next time we visit, my daughter can take out the crowns and put them on her head and dance around the bedroom. And my prayer for that sweet princess of mine is that she will know how much she is loved and accepted; not for what she does, but for who she is. Only there will her identity be found. "I Don't Know About You, But I'm Feelin' 42"
I have to admit it, Taylor. You’re song “22” has been playing in my head for months. Not as an anthem, but a parody. I’ve reworded your lyrics and renamed your title a thousand times. Unfortunately, I can’t seem to come up with anything that doesn’t resemble a third grade math problem…. You see, I’m 42 today. And I have to say that singing the younger, hipper version of your song has made me feel well, a little slighted about life. You’re dressing up like a hipster. I’m lucky to find an ironed shirt for work in the morning. You’re having breakfast at midnight. I’m serving cold cereal to my family for dinner. I think you get the picture, here. While you’re ditching the whole scene, I’m doing the daily grind. I’m tired, Taylor, and the contrast of your life compared to mine leaves me wanting to pop the top down on my convertible (if I had one) and drive far away from my adult responsibilities. ​My nine year old came down the stairs today and gave me this paper as a birthday gift. He’ll be embarking on the teen years soon and so anything that he makes me these days is beyond precious, but this took the proverbial birthday cake today. In the midst of the messy, frantic, I can’t get this right EVER life that I feel like I am living, my sweet prince sees THIS! 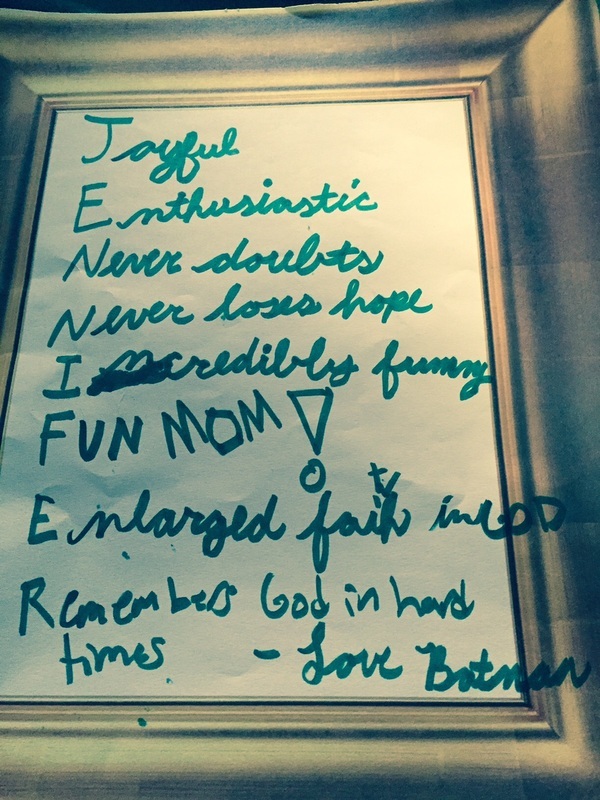 I mean, this is grace at it’s finest; God doing this miraculous thing where I give Him my broken mess and he gives me His goodness and then my kid picks it up and writes it down about me and I say, AMEN to it all. "Yea….I’m happy, free ,confused and lonely at the same time. It’s miserable and magical oh yea…. I don’t know about you.. but I’m feelin' forty two. Everything will be alright when I don't know what to do. You don’t know about me, but someday you’ll want to. Everything will be alright if we just keep dancin' like we're forty two ooohhhh"
Oh, and did you notice that he signed it, “Love, Batman”? Life. Is. Good. He sat across from me at the restaurant, trying to sweet talk me for my phone while we waited for our food to arrive. This was the first time that I had my nine year old all to myself in over a month and I was looking forward to our evening together, just the two of us. Finally conceding to the fact that technology was not part of the plan for the evening, he began to venture into discussions with me about things that intrigue the mind of a young boy who is on the cusp of a double digit birthday in June. We racked our brains to come up with answers to important questions like what three things we would most like to have if stranded on an island and what we would do with a million dollars. I love capturing those moments of insight and humor with my kids. And once in awhile, one of them will say something to me that pierces my heart and reminds me that there is so much that God is trying to teach me through my children. While eating our meal, I glossed my napkin over the side of my face; the same side where a dark brown birthmark is situated by my lip. Watching me, my son put down his burger and said, “Mom, I don’t think about your birthmark when I look at you. I don’t really see it anymore.” The comment took me a bit by surprise because well, let's face it, that mole is not hard to miss. He then explained, bless his heart, that when he looks at me, he just sees me as his mom, not the mark on my face. If he weren't nine, I would wonder if he knew about the struggle that I have in life to keep my blemishes from plain sight. I might even ask him if he had made the birthmark comment in an effort to encourage me because here's the thing... I often lack the courage to let others see my faults and I would much rather present a pretty face to the world. I was a huge fan of the Dixie Chicks in the nineties and embraced the song, "Wide Open Spaces" as my anthem. I remember rolling the windows down in my jeep and singing the tune to the top of my lungs. Oh how I wanted the words of that song to encapsulate who I was; an assured and fearless young woman who unflinchingly took risks and dared to follow her dreams. But in reality, I was anything but ready to strike out for all the world to see. Forget the wide open spaces, give me a small quiet room with zero percent chance of failure. No big mistakes here, thanks. Just tiny gaps, please. Tiny gaps of right choices and unending anxiety about screwing the whole thing up in front of people. I've made some progress in my attempts at lionhearted living since then, and what I am finding is that true bravery is found in letting people get to know my story...just as it is. Nothing photoshopped. No perfect filter. Just me as I am for all the world to see. I would much rather be authentic than impressive, and that requires vulnerability. I think the real reason why I used to love that southern anthem of mine was because the lyrics suggested packing up and starting over with new faces; a chance to get it right with a clean slate of people. People who don't see my marks and are impressed by my perfection. But true freedom can't be found there for me. It's found right where I am with the relationships I have that are real and sometimes messy because we've shared the truth about ourselves and are still sticking around in spite of it. We become immune to impressing others when we settle in and let them see us in our broken, messed up story. Our lives become relevant and redeemable when we choose to share the reality of our busted up beings instead of some trumped up version of who we really are. There is beauty in sharing the imperfect adventures that we are living as we begin to view the shattered pieces that we try to hide as situated segments that God wants to use. We can stop striving to cover up the potholes and quit making pitstops on the road of pretending. No more detours driven by doubt, no more u-turns in our unsettled souls. 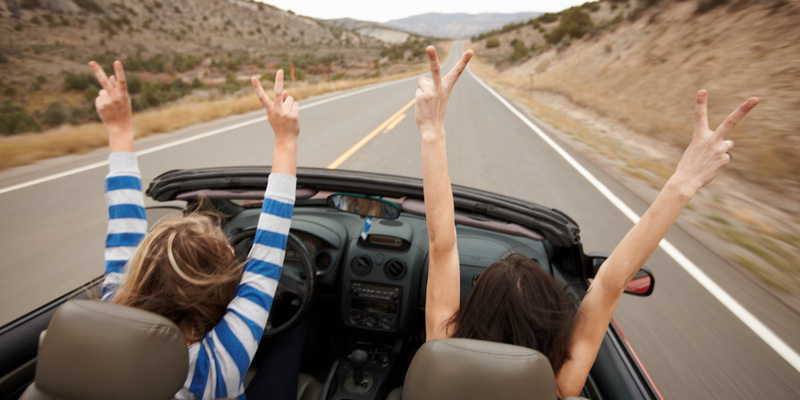 Just our feet on the gas, with the wind in our hair, as we bravely share the broken road. I’m sitting here bracing myself for the bombardment of snow that is beginning to fall in our area. It is predicted to be a record breaking storm with totals as high as twenty to thirty inches. A state of emergency has been declared, weekend events have been cancelled, and the empty grocery store shelves that I walked by two nights ago looked like something out of an episode of The Walking Dead. It appears from everything that I have read, heard, and seen that this storm is going to go down according to plan. Despite the potential for power outages and the threat of dangerous conditions that a storm like this can bring, this is the kind of blizzard that I like the best; one with a plan that has met the expectations. I don’t know about you, but I’m really good at setting them. And while it’s great to have goals and something to aspire to in life, I’m learning that some expectations can come with a lot of unnecessary pressure and that’s not always so dandy. The other problem too, I suppose, is that the expectations aren’t usually for me. Given the unpredictability of weather, I don’t envy the job of a meteorologist any time of year but I especially would not want their job in the winter. A weather prediction becomes the expectation and if it is not met, the online jungle that we are living in quickly becomes a breeding ground for judgement and harsh comments towards the poor weather soothsayer who got it wrong. And let’s not even talk about the suffering soul who has to bear the weight of deciding school closures. Good grief. Let’s face it...sometimes storms just don’t live up to all the hype. And while I realize that the negligent Nostradamus who forecasted the storm and got it wrong should not have to be roasted for it, I have to confess that my response to my own unexpected let downs in life are sometimes not much better than the cranky so-called weather fans who didn't get the white stuff that they wanted. I’m not proud to admit it, but I can easily put unfair expectations on those that I love and then cut them to the quick when they just don’t measure up to what I had in mind. This is a really difficult thing for me to write about because I want you to think that I am really loving and accepting and patient and kind. I aspire to be those things in all areas of my life. I really, really do. But the thing is that like you, I'm only human and that whole humanity thing can often get in the way of how I'm supposed to be living and loving on this journey called life. The hubs and I are huge fans of Fixer Upper on HGTV. We love Chip and Joanna and aspire to be just like them. Not only do we delight in their eye for remodeling and design, but we love how funny they are together. I am particularly fond of how side-splittingly supportive Chip is with Jo-Jo and feel that every husband can learn something from him in terms of the art of flattery with your wife. So, the other day I was really excited about something and couldn't wait for my man to get home so I could share it with him. Before he even really got in the door and had a chance to take off his coat, I had unloaded the entire entertaining event with more excitement than I had mustered up in a long time. His response was.. well...a little lacking. I then went on to explain that Chip would have had a much more excited reaction for Jo-Jo than the dead in the water reply that I just received. Needless to say, my helpmate in life proceeded to spend the next five minutes reminding me that not only is he not Chip Gaines, but we don’t have a television show or any real talent for home renovations. He also let me in on the fact that I am no Joanna when it comes to the free spirited- let's try some adventure in life perspective that she has so I really had no room to talk. A much needed reality check had been delivered my way. I had done it again and was devastated to say the least at the revelation that not only were we not the power couple of shiplap and light fixtures, but also that I had pretty much expected that we could be if only I could just get an upgrade in the encouragement department. I'll take some unrealistic expectations for my spouse with a side of nothing out of the ordinary for me, please. Unfortunately, I can fall into the expectancy trap pretty easily. I forget that life isn’t supposed to be perfect. I watch a show, I see something online, I talk to someone who seems to be living the dream and before I know it, I think that my little world and the people in it should be more. The weather is a perfect metaphor for life in that so much of it is out of my control. I can't control events. I can't control people. Most days, I can barely control myself. And yet, somewhere along this fun little journey of life, I picked up the idea that not only was I capable of controlling others with unrealistic expectations, but that it was my job to do it. Worse yet, I can think of things that I let myself off the hook for a thousand times a day but woe to anyone else who doesn't measure up in my eyes. This whole dilemma is really nothing more than a reflection of the big storm that rages in my mind and heart. I'm riddled with blowing winds of insecurity, barometric pressure changes in the measuring up department, drifting flakes of what my life should and shouldn't look like, and howling winds of scornful pride. So, in an effort to be a little bit more like Jo-Jo, I'm going to set out on a little adventure in redesign when it comes to caving to the pressure of unrealistic expectations. And in doing so, I hope to see the benefit of a fuller life that looks a little less like turning a prediction into an expectation and a little more like finding the beauty in letting the snow fall where it may. Hitting the wall: Life lessons learned from my one and only marathon. I've heard it's been said that running is like the opera; you either love it or hate it. I’m obviously on the love side of things as I’ve been a runner for almost thirty years. I started in junior high with track and quickly became addicted to the runner’s high (yes, it’s real) and haven't stopped since. I love the way that running makes me feel both physically and mentally but I definitely have a few quirks about the way the whole thing goes down; I have to run in the morning, I don’t listen to any music, and there is no way that I would even consider stepping one foot out the door without at least one cup of coffee under my belt beforehand. Running a marathon had been on my bucket list since my twenties, but life events and lack of gumption kept me from doing it. By the time my mid thirties rolled around, I had done a couple of smaller races and felt like it was time to tackle the biggie. I registered for the Rock N Roll Marathon in DC and still remember the surge of nervousness when I clicked the submit button on the online form. I downloaded a training guide and followed it religiously as the weeks rolled along and the miles started racking up. As the countdown grew closer, I was pounding out two to three hours of running a day. I was so proud of the hard work that I had put into the process. I hadn’t taken a single day off unless the protocol called for it and I honestly felt like I had this whole marathon thing in the bag. The long awaited race day quickly arrived. I remember nervously walking to the starting line as the DJ cranked up the tunes and the emcee counted down the minutes until the race would be set into motion. The excitement was overwhelming as the starting gun soon fired and I was ushered into a sea of bodies all moving in the same direction. I was able to shake off some of the nervousness as I got into a running groove and enjoy the spectacular sights as we ran through some of the most beautiful parts of the city. The first ten miles or so seemed like I was gliding on air and while I knew from my training that I needed to pace myself, I remember thinking that the next few hours weren't going to be that bad. At mile thirteen, the momentum shifted. Because the race was designed for both a half and full marathon, the large group that I was running with suddenly took a turn. These were the half marathon runners and they were headed back to the finish line. The first mental hurdle of the marathon hit me as I struggled to work through the sudden drop in people that had been running beside me moments before. I was beyond envious that my former racing cohorts were wrapping this up and heading back to the tents for a massage and some food. I took a quick look beside and behind me and realized that I was suddenly alone. And then, another terrifying thought quickly presented a wave of panic throughout my body. I had to now run this entire length all over again. You know that saying about the rubber meeting the road? Yea, that was happening in every way. I decided to put in my ear buds and listen to music (thanks to my husband who insisted that I have some just in case) in an effort to try to overcome the self defeating conversation that was taking place in my mind. I cranked up the song and determined that I was going to finish this thing no matter what. I quickly reset my pace, dug in my heels, and soldiered on. And then, around mile seventeen, it happened. I hit the proverbial running wall which is the inevitable event that occurs for many in a marathon when your body suddenly starts shutting down. You become excessively fatigued and begin to cramp as a result of your body using all of its carbohydrates and switching over to take energy from your muscles. And when I say that I hit it, I mean that without the slightest warning, everything that was working moments before came to a screeching halt. The desire to finish was gone, the limbs of my body didn't work, and my mind and heart began to justify every single reason why laying down on the pavement and being picked up by the garbage truck, despite all of the training that I had put in, was the best solution to ending the madness. 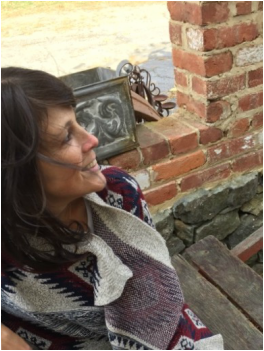 With my husband, friends, and children waiting for me at the finish line, there was no way that I was going to quit. I quickly determined that it was going to take everything that I had in me to finish and I spent the next nine miles struggling to lift my feet and telling myself a thousand times each minute to put one foot in front of the other in an effort to make it home before dark. Just keep going. Don’t slow down or you will quit. Just finish the race. The rest of the experience was really a blur aside from seeing people holding signs and feeling desperately defeated by the 23 mile marker as I tried to comprehend that I still had three more miles to go. Eventually, as if a siren had gone off for a four alarm fire, I heard a woman’s voice from somewhere alongside of the road finally declaring that I only had a quarter of a mile left. I somehow managed to pick up the pace as I rounded the corner. The applause of the spectators along with the hopes of seeing the familiar faces of family and friends were inevitably what somehow managed to hurl my lifeless body over the finish line. I remember someone placing a medal around my neck, officially dubbing me as a marathoner as I reached for a bottle of water and scarfed down a banana. I was both elated and exhausted afterwards as my loved ones gathered around and congratulated me on this monumental achievement. Don’t compare. While I felt good about the training I had done, I remember psyching myself out as I began looking around at the other runners before the race began. I suddenly felt like I was in way over my head given their sleek bodies and four hundred dollar running sunglasses. It can be easy to look around and see what others have or might be capable of and think that I am suddenly not qualified to be a part of it. I might miss out on new adventures when I measure my own worth against someone else instead of who I was uniquely created to be. Don’t be afraid to blaze a trail. It’s okay to stay on my own course when the pack leaves me. When the half marathon hung a sudden left without me, I was so tempted to follow them and call it a day. Often times it can be difficult to keep setting out in a direction that others are not taking. I’m learning that the old cliche’ about taking the road less traveled is actually anything but a detour in my life. Don’t quit the hard stuff. Sometimes it can be so difficult to keep pressing on in life when things get tough. There was so much about that marathon that was painful and it took everything that I had to keep going. Crossing that finish line showed me how important it is to keep moving forward, especially when it's the last thing you feel like doing. Don’t be defined by accomplishments. Shortly after the marathon, I felt like I needed to sign up for another one. While I had felt completely satisfied that I had achieved my goal, I realized that I was beginning to put some pressure on myself that this had to be “my thing.” I had no desire to go for a jog for months after the race but there was still a nagging voice in my head that told me that I needed to get back out there and do it again. Thankfully, I rejected this notion, offered myself some grace, and took a yoga class instead. The change in my workout routine was a wonderful reminder to get out of the ruts in life that I feel pressured to stay in. I eventually returned to running and began to love it again, but I don’t know if I would have if I hadn’t taken the time away from it that I needed. Finishing a marathon and then walking away for a bit to try something different was a freeing experience that taught me that I am not defined by the things that I do. Don't underestimate the power of words. The cheers and encouragement from those along the sideline during the race were a lifeline from one mile to the next. I couldn't wait to see someone and have them tell me that I was going to make it. When life gets tough, I need to find my people and let them love and encourage me. And I need to be there to do the same for them. At the end of the day, the marathon of life is really no different than lacing up your shoes for 26.2 miles of pavement pounding purgatory. The race is tough and painful, the voice in your head insists that you give up, exhaustion takes over, and everywhere you look it seems that others are taking the easy way out. But eventually, the finish line is in sight and it’s better than you ever dreamed. And when it's all said and done, you can say that you finished well, even if you did have to be carried to your car when it was over. A Cookie Cutter Christmas: Why I'm done trying to make the perfect Christmas happen. They were scattered all over my kitchen counter, mocking me and my failed attempts to capture the Christmas spirit. 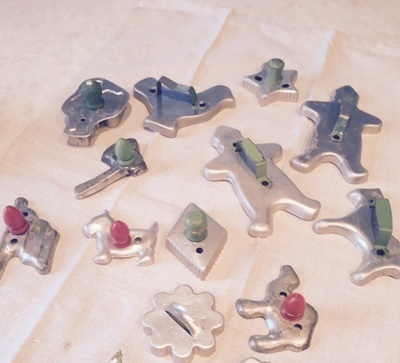 These old fashioned tin cookie cutters with their wooden painted handles were once my grandmothers. My aunt had given them to me after she passed away. My daughter was just a toddler at the time, but my Aunt Linda thought that I might like to use them for Christmas baking when she was a little bit older. Oh, how right she was. I don’t think that I have ever received a more meaningful keepsake. I have so many fond memories of watching my daughter pull them out of the old red pot where they are kept. The look of excitement on her face is priceless as she carefully selects her favorites; the old fashioned Santa Claus, a gingerbread man, the turtle dove. My son is always next in line, dipping his hand in to fish out the primitive hatchet. And no Christmas cookie sheet in our home would be complete without the silhouette of a camel or lion carved by our boy. Knowing that my grandmother once held the same utensils that my children are using makes me feel rooted in tradition and the love of family. Baking with Nana Miller’s cookie cutters is always a hallmark of our Christmas season that has brought me so much joy. I guess I should preface this story by saying that I was feeling incredibly behind with all things Christmas this past week. No matter how hard I tried, I just couldn't get ahead of the game. Exhausted, I collapsed into bed every night without a single vision of a dancing sugar plum. No teacher gift was made by my loving hands. My house was in disarray, and aside from a few packages that arrived from Amazon, not an ounce of Christmas shopping had been done. Everything about Christmas felt like a great big to do list instead of a festive season of joy, and I was crying all the way. Determined to reclaim it, the hubs and I decided to divide and conquer yesterday. He would brave the crowded stores like the chivalrous man that he is. I would get things caught up around the house and we would eventually meet back together and manage to enjoy the beloved tradition of Christmas baking. Surely, the cookies would bring back a sense of Christmas accomplishment to this household and we could then move forward with great tidings of comfort and joy. After cranking out a few chores and errands, I picked my daughter up from a friend’s house around noon. Completely sleep deprived, I knew that my beloved tween was most likely going to endure some sort of emotional breakdown if she didn’t have a chance to recharge. Despite this well known fact and because I was all about making some happy memories if it killed me, I held tightly to my vision for the afternoon. We were moving right along with things at first; talking about her night and the fun that she had on the last day of school. And then, just as I began to take the cookie ingredients from the pantry, it happened. I won’t get into the gory details as I’m sure you have your own stories from the trenches of raising pre-teen girls, but given my spirit of frenzy and her lack of rational thought, let’s just say that the conversation ended with me sending the sweet cherub to her room for some quiet time. And I was beginning to wonder if I needed the same. So much for the smell of cookie nostalgia wafting through my hallways. And as I heard her footsteps trudge up the stairs, my eyes filled with tears of frustration. I had spent the last two weeks chasing down Christmas like a boss. I was doing everything in my power to make jolly happen up in this place and with every effort of striving, it was getting farther and farther away from me. "Let’s just skip the eggnog and caroling,” I grudgingly grumbled as I stared at the cookie cutters, “This just isn't my year to do Christmas." Then, like the first snowflakes of winter that fall, the memories of my grandmother began to gently return to me one by one. Her entire life was about the Christmas season but it never pointed to any one tradition, no matter how sweet. Instead, it pointed to a baby who came over two thousand years ago to save the world. She lived a humble life of gratitude because of this and it was because of her example that I came to believe the story of the baby as well. And despite what I already believed to be true, there I was, feeling like the joy of Christmas depended on me. I miss the entire meaning of the Christmas season when I forget to celebrate what has already been done, and instead believe the lie that none of it can be ushered in without my hard work. We eventually did manage to get those cookies baked. After a big hug and some laughter through tears, we decided to try again. And the grace of that moment was yet another reminder that the only work of Christmas that really matters is the work that takes place in my heart by a God who loves me. This holiday season might just go down in the books as one of the all time, most ill prepared Yuletides that we have ever had. But I can breathe a sigh of relief in knowing that despite what does or doesn't get accomplished, Christmas has already come; without ribbons, without tags, without boxes, without bags, without anything that I could have done or ever could do to make it happen. And because of this I can find my rest in the midst of a busy season and can sleep in heavenly peace.